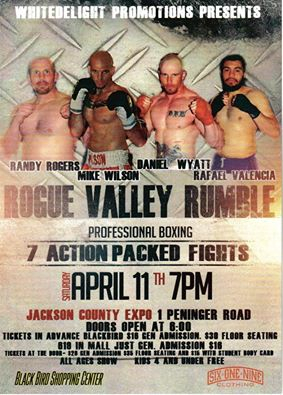 The Pacific Northwest’s top cruiserweight prospect “Irish” Mike Wilson will make his long awaited return to the ring in his hometown of Medford, Oregon Saturday, April 11th at the Jackson County Expo. Fighting under the promotional banner of his wife Jennifer Wilson’s newly formed company WhiteDelight Promotions, Wilson will headline a stacked seven bout fight card filled with regional talent in intriguing match-ups. The show will mark the first professional fight card in the Medford Area in over thirty years. In the eight round main event, the undefeated Wilson will take on fellow unbeaten prospect Derek “Pretty Boy” Williams of Kansas City. Wilson will be looking to shake off nearly two years of rust when he steps in the ring, having been inactive since August of 2013. In his last bout he scored an exciting six round unanimous decision victory over Mike Alderete in Canyonville, Oregon. The crafty and always exciting Wilson will look to add his eleventh professional win in front of his hometown fans. His aggressive, fan-friendly style has made him a very popular fighter among aficionados in the region and, as is usually the case when he fights in Oregon, they will predictably come out in droves to support him. He will certainly have his hands full against his heavy-handed opponent. Williams, who is an undefeated pro in both boxing and MMA, has won every one of his four professional boxing bouts inside the distance. The Kansas City Native is a rangy fighter with power in both hands. This will be the first time Williams will fight outside of Kansas City and there is curiosity to see how well he does when he steps outside of his comfort zone. Both have a lot riding on this fight in addition to keeping their undefeated records intact. Stylistically and on paper this promises to be an interesting fight. Another Northwest hopeful will look to get his career back on track on the card after a long stretch of inactivity. Portland, Oregon’s Gabe “Ducky” Pineda will look to add another win to his unbeaten record after nearly a two year lay-off. His last bout took place in June of 2013 when he defeated Dave Petryk in a six round war in Tacoma, Washington. He will take on the undefeated former Nigerian Olympian Rasheed Lawal in a four rounder. All action slugger Corben Page of Springfield, Oregon will also see action on the show. Page is one of those fighters who’s record does not reflect the talent he has. Although he’s lost more than he’s won in his fifteen fight career, he’s a skilled and tenacious fighter, willing to fight anyone on a moment’s notice. Two years ago he took on arguably the best young up-and-comer in the sport today, Felix Verdejo, in his native Puerto Rico on short notice. He lost by way of fourth round TKO, but gave a good account of himself. He’s a fighter that can always be counted on for a good action fight. He will take on Redwood, California’s Jesus Partida in a four round match-up. In what is sure to be a high-contact type of fight, Tigard, Oregon’s Sammy Perez will face off with Josh Frias. Perez is a quick and aggressive fighter known by Northwest fight fans to make good fights. Frias is a come-forward banger looking to add his second professional win to his record. They will meet in a four round featherweight bout. Rounding out the undercard will be three other fights. Rafael Valencia of Medford, will square off with Klamath Falls, Oregon’s Cole Milani. Also from Klamath Falls, Randy Rogers will battle Justin Milani of Pendleton, Oregon. Featherweight stand-out Claudia Gutierrez is also scheduled to fight in a four round women’s bout, although her opponent has not been announced yet.